Park Junction is at the bottom of the Ebbw Vale line. Curves from Cardiff (left) and Newport (far right) converge here, then the freight line to Machen branches off to the left. 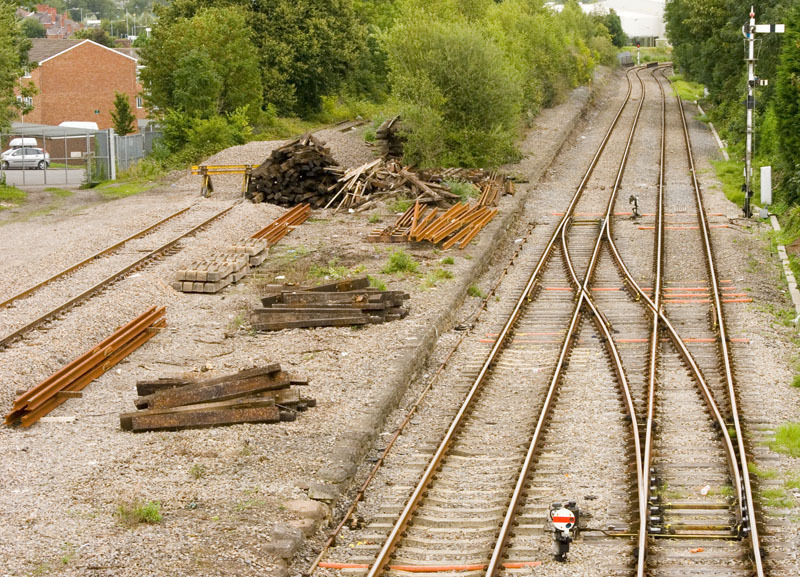 The main line to Ebbw Vale will be re-opening to passengers shortly, sponsored by the Welsh Assembly Government. 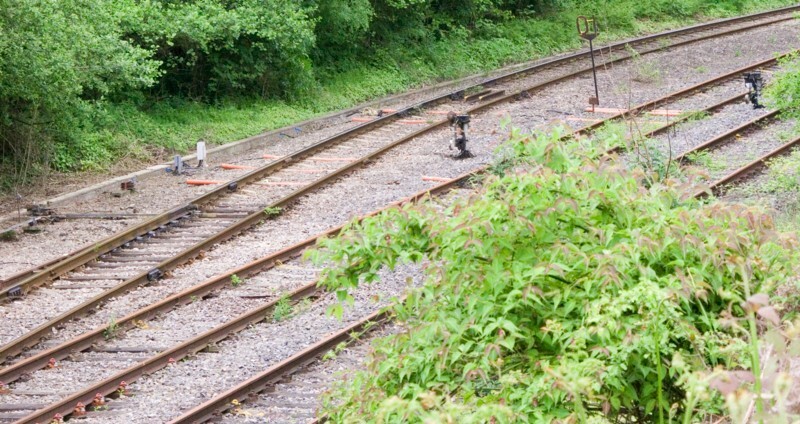 A closer view of the junction layout and signals. 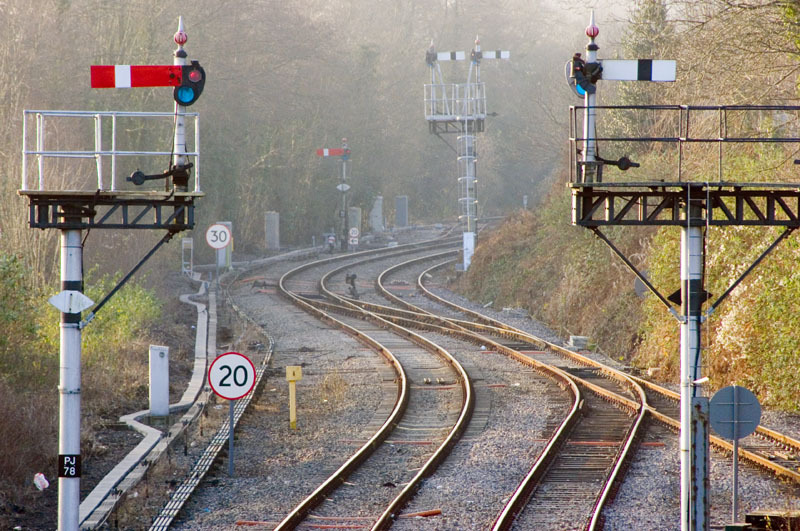 The point leading to the Machen line can just be seen beyond the far signals. 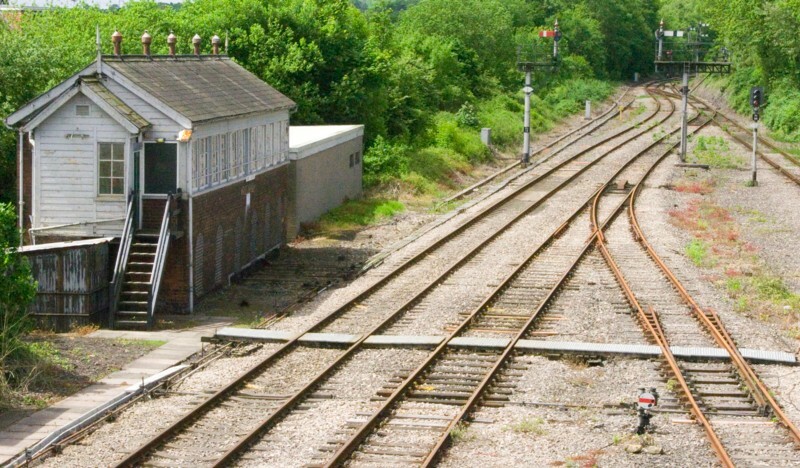 The signalbox. The layout here used to be far more complex, with six tracks as far as Bassaleg Jct where the Machen line originally diverged. The view in the opposite direction. 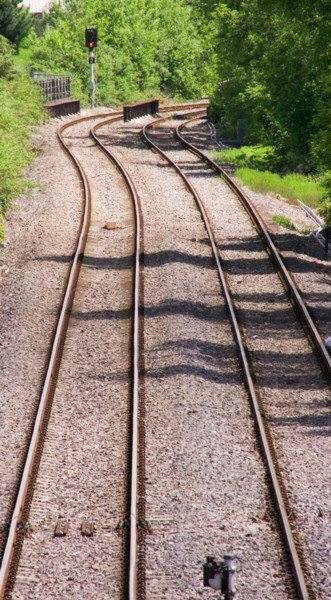 The line on the right is the curve to Ebbw Jct, where it joins the main Newport-Cardiff line; on the far left is the chord to Gaer Jct and Newport. 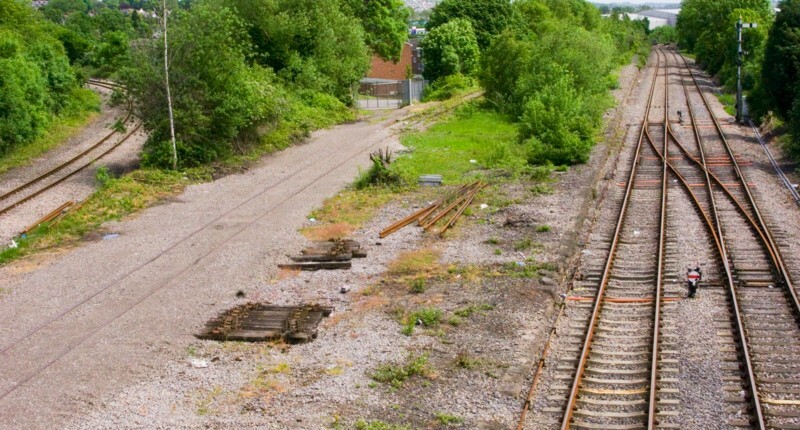 The line in the middle, a dead-end siding known as the Five Whistle Road, is all that remains of a former direct line to Newport docks. In the distance, a colour-light starter towards Ebbw Jct can be seen. A closer rear view of the home for the line to Ebbw Jct. The disc reads to the Five Whistle Road. 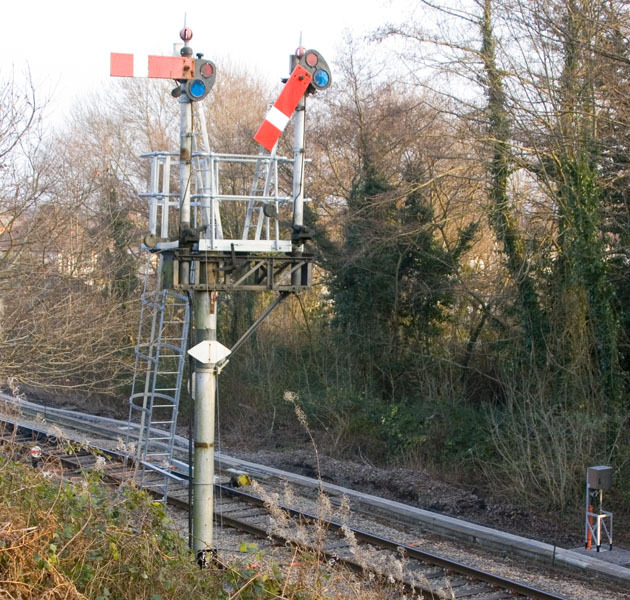 A close-up of the disc controlling departures from the Five Whistle Road. 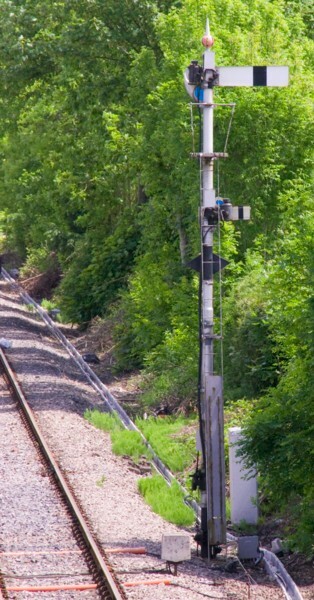 Behind the signal is a mechanical point detector, which prevents the disc being cleared unless the points are correctly set. The point blades are connected to the metal slide that runs perpendicular to the rails, and in which a notch can be seen on the left. 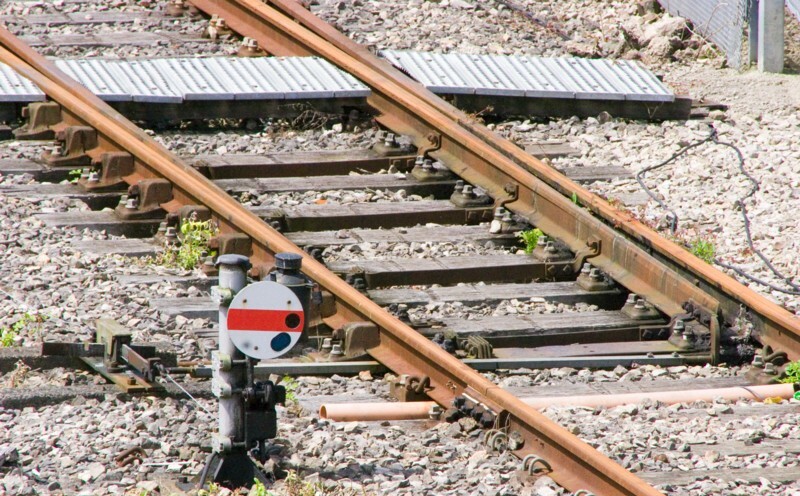 When the points are set for the siding, this notch slides to the right so that it lines up with the other strip, parallel to the rails, to which the signal wire is connected. Unless the notch is in that position, the strip connected to the signal wire cannot move, and therefore the disc cannot be cleared. The up starter and, beyond it, the points where the line to Machen diverges. 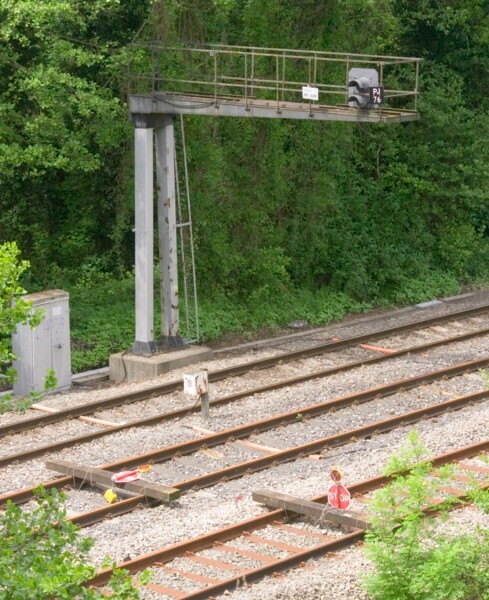 The main arm reads to the Ebbw Vale line while the disc controls movements to the Machen branch. Note the missing spire from the top of the finial. 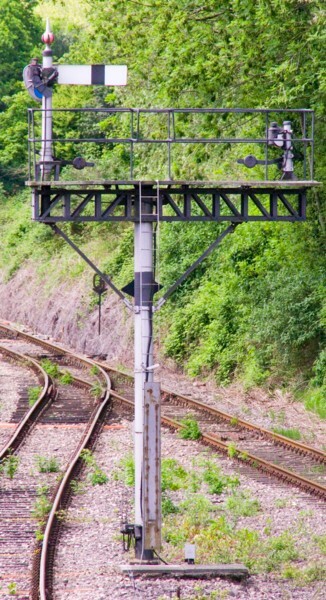 The down junction signal from the Ebbw Vale line (PJ2). The disc behind it reads from the up line, which is also used by down trains from Machen. The lines shortly beyond the junction. 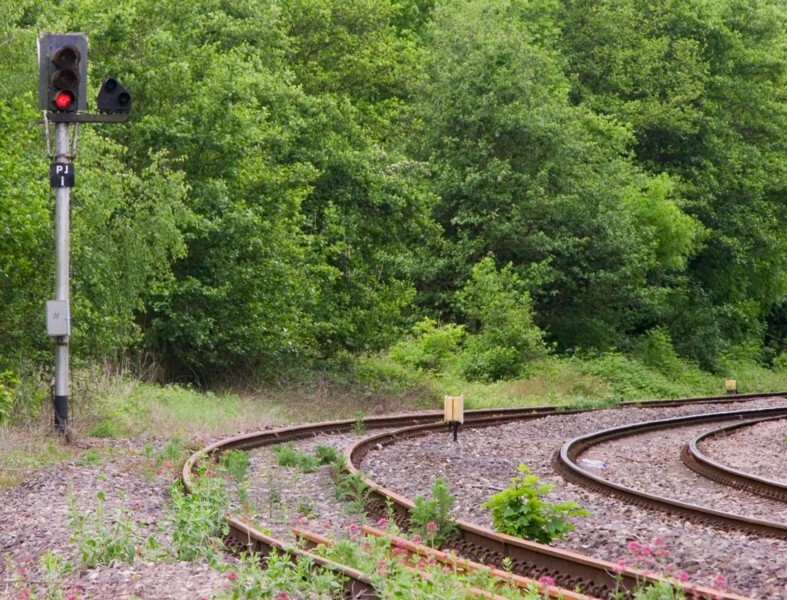 Discs can be seen for controlling trains arriving from Machen and for reversing moves from the up Ebbw Vale line. A rear view of the up starter, showing a metal plate that has been attached to the ladder provided for maintenance staff. The signal lamp will probably have been converted to electric. The up advanced starter (PJ76) for the Ebbw Vale line, which singles shortly beyond. The line furthest from the camera is the Machen branch. Stop blocks have been installed on the Ebbw lines as they are currently out of use. The down Ebbw Vale home, which protects the single-to-double junction. 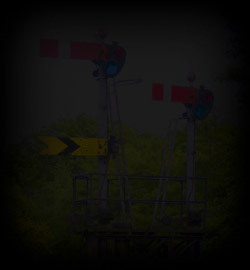 The position light reads to the up line for shunting moves. 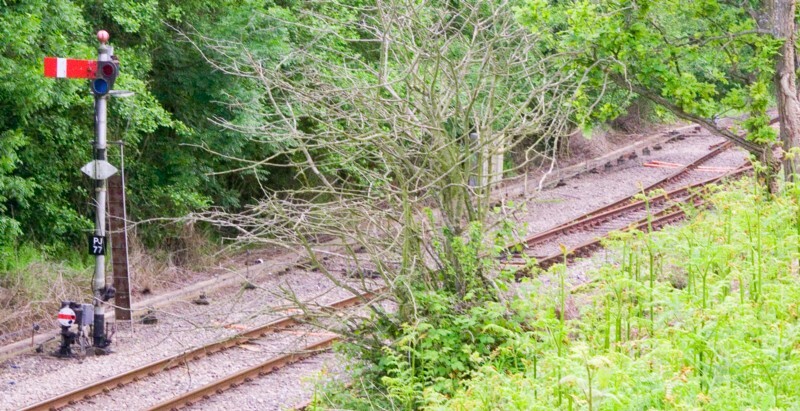 The track on the right is the Machen branch again. The Five Whistle Road has now been truncated somewhat. To the right is the chord to Ebbw Jct. A closer view of the up starter, Machen junction, and the rear of the down innerhomes. 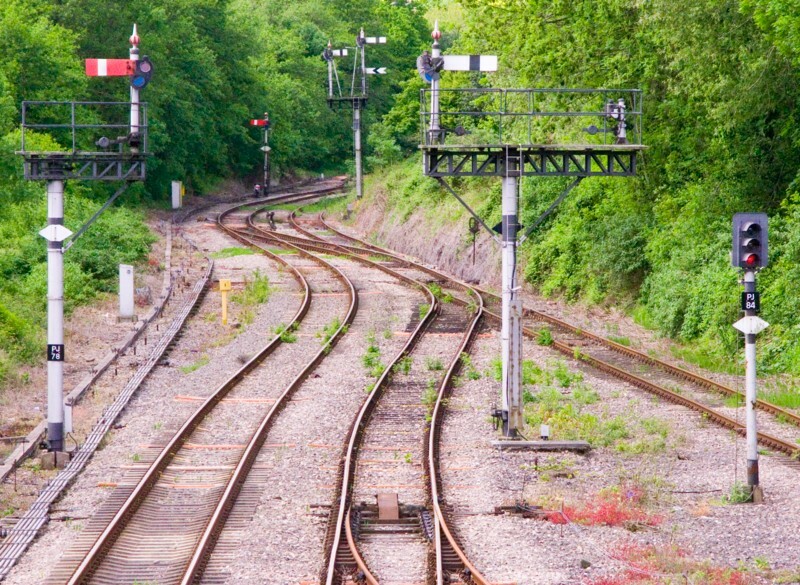 A number of changes have now been made to the signalling here in preparation for the Ebbw Vale passenger service, which is now due to start in the new year. ... and replaced by the fixed distant board you can see on the left here. A close-up of the distant board. The white triangle on the signal numberplate is known as a "delta plate", and indicates that the signal cannot display a stop (danger) aspect. 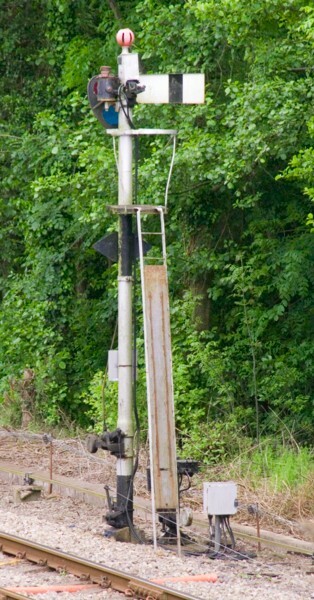 The modified junction signal. Note the much more substantial stairway and platform railing that's been added to make the signal safer for maintenance staff. 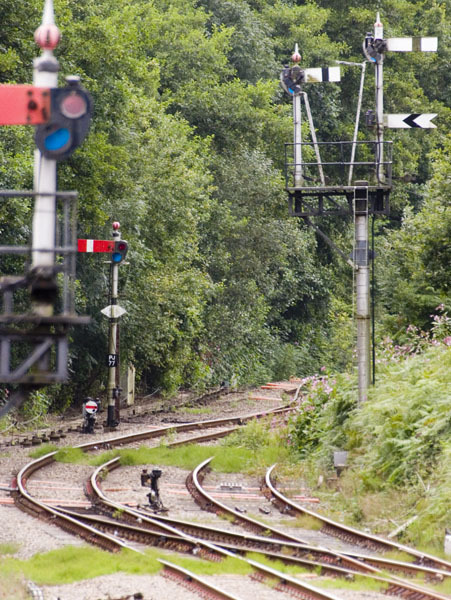 The signal to Ebbw Jct has been pulled off for a training train to go through. 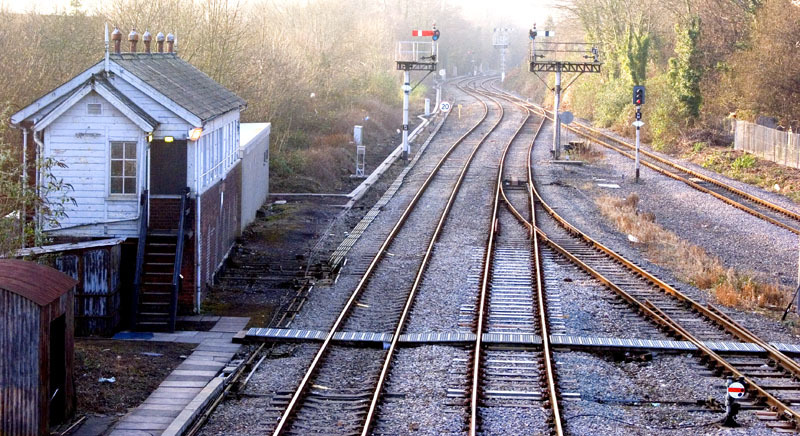 A wider view of the junction and the other signals, which have been left unchanged. The up starter, with its new 4' arm. 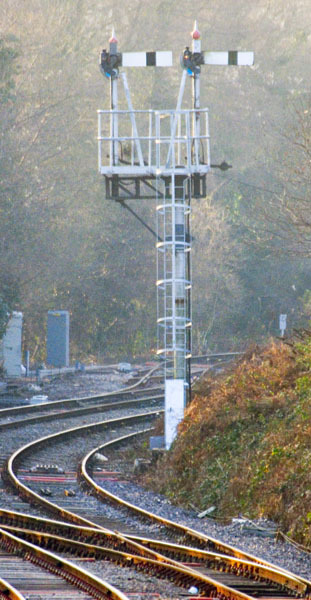 The much more substantial ladder is very apparent in this rear view of the junction signal. 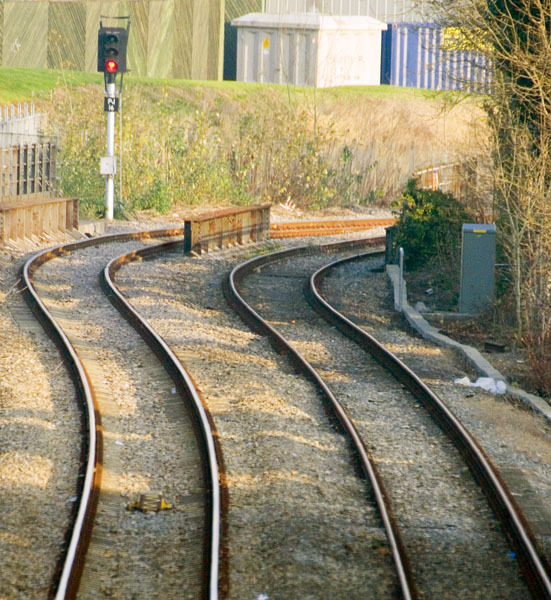 The signal's TPWS loops can also be seen opposite the signal in the "four foot" between the running rails. A better view of the down starter towards Ebbw Jct. Its AWS ramp can be seen in the foreground. My thanks to Richie Jones for providing assistance with the captions for this page. 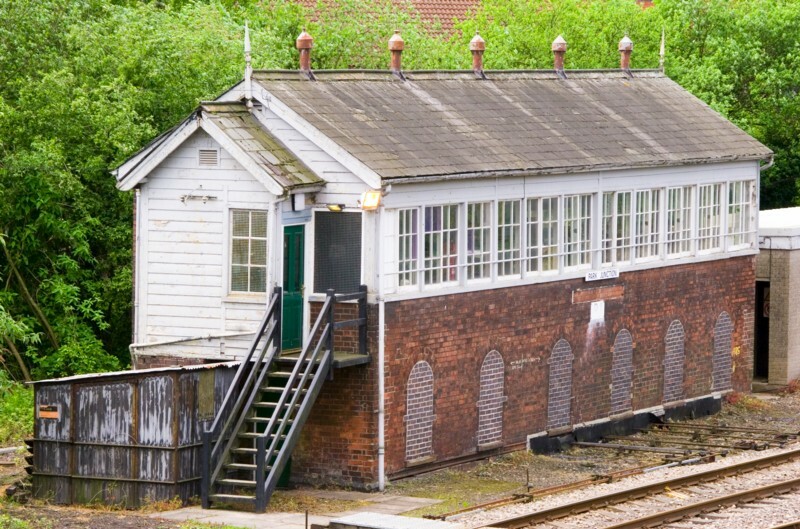 More information about Park Junction signalbox can be found on the Signalling Notices site.